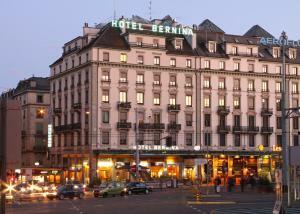 Benefiting from a prime location opposite the Main Railway Station of Geneva, Hotel Bernina is adjacent to a big shopping centre and only a 5-minute walk from Lake Geneva. The property is also next to the bus terminal and the business district as well as the commercial area of the city. The United Nations and other international organisations are approximately 1.6 km (one mile) away. Venture out, enjoy the night life of Geneva and retreat to your spacious, elegant and bright room for a good night's rest.